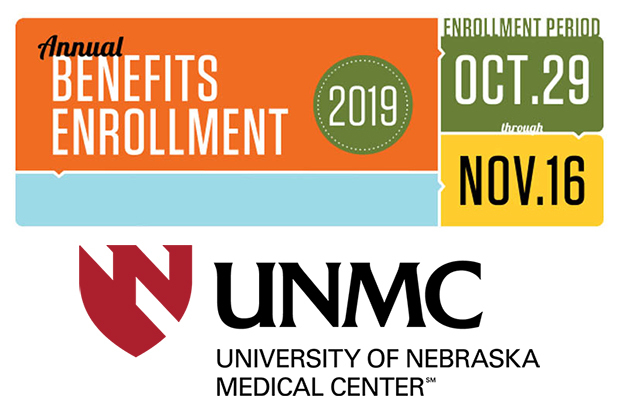 NUFlex enrollment for 2019 will be open from Monday, Oct. 29, through Friday, Nov. 16. During this time, benefits-eligible employees will be able to make changes to their tobacco designation, enroll in Flexible Spending Accounts and complete the Health Risk Assessment. Employees will also have the ability to review their current benefit choices and make changes for 2019. To enroll, visit Firefly between Oct. 29 and Nov. 16 and select "Benefits Enrollment" on the Employee Self Service page. Employees can review their current benefits plans at any time by clicking "Benefits Participation" on the Employee Self Service page. In 2019, the University of Nebraska will be making a number of enhancements to the university's health plan that will lower costs, expand services and better meet the health care needs of employees at UNMC and the other campuses across the NU system. Beginning Jan. 1, 2019, the university's health insurance plan will be administratively managed by UMR, a United Healthcare company, and its dental insurance plan will be managed by Ameritas. CVS Health will continue to provide pharmacy insurance. The changes follow a comprehensive review of the university’s benefits plan that was led by a 15-member committee representing faculty, staff and administration. Details about enhancements to the university's health plan were shared in September 2018 in an email from NU President Hank Bounds. As part of the University of Nebraska's move to UMR as its third party administrator for health insurance, UMR has launched a resources website which allows for employees to determine whether their current doctor or hospital is in-network. UMR also provides a summary of their plan on the website, as well as a short YouTube video providing a summary of their online services. Questions for UMR can be directed, by phone, to 844.659.5059. As part of the University of Nebraska's move to Ameritas as its third party administrator for dental insurance, Ameritas has launched a resources website. Resources on the site include a summary of the benefits plan, a video detailing specific aspects of the plan, a comprehensive resource guide and the ability to search for in-network providers. Questions for Ameritas can be directed by email to group@ameritas.com or by phone at 877.495.5581. The addition of a high-deductible health plan option that will allow members to take advantage of a personal health savings accounts. This option will be in addition to, not a replacement for, our current high, basic and low options. The enhancement of flu shot coverage for employees who complete the annual health risk assessment through a $0 co-payment for flu shots administered through an in-network pharmacy. CVS customer service can be reached at 888.202.1654. Premium rates will go down 2 percent next year. In addition, there will be no increases in deductibles, co-payments or maximum out-of-pocket payments. The new plan will include coverage for fertility treatments - a change many faculty and staff have sought for some time. The plan will pay 100 percent of preventative care visits for health plan members under age 2, an improvement from the current maximum allowance of $600. The preventative care allowance is being raised from $300 to $400 for plan members over age 2 who complete the health risk assessment. Nebraska Medicine will be recognized as a preferred provider, allowing for lower deductibles, co-insurance rates and maximum out-of-pocket payments. The plan will cover tubal ligations and vasectomies. Long-term disability rates will decrease by 25 percent. Life insurance rates will be 20 to 30 percent lower than last year's premiums. First, the health insurance industry is changing rapidly, and it was important for us to test the marketplace to make sure we continue to provide employees and their families with a competitive benefits plan. We’re also looking for opportunities to achieve savings in a time of limited resources. The benefits committee unanimously recommended new insurance providers that will help us continue to meet our goals for competitiveness, cost-effectiveness, and satisfying the essential health needs of employees and their families. United Healthcare currently provides benefits for almost 426,000 Nebraskans; local customers include the State of Nebraska, NelNet, Peter Kiewit, Union Pacific, First Data, ConAgra, Nebraska Medicine and many others. How do I know whether my current provider is in-network for UMR or Ameritas? We expect minimal disruption in this regard. Employees are encouraged to contact UMR, Ameritas or their providers directly to determine whether their providers will still be in-network. (The university’s health insurance will be offered under the United Healthcare Choice Plus network.) In rare instances where a provider is not in-network, both UMR and Ameritas have indicated they are willing to add providers to minimize the chances of any employee having to find a new doctor or dentist. I read the university will save $12 million from the changes. How can we save that much money without significant changes to our benefits plan? It is important to note the $12 million represents total savings from our health, dental, pharmacy and life insurance plans, including employee out-of-pocket costs. About half of that, $6 million, will come from the state-aided budget, representing savings that will help address our budget challenge. We want to reiterate that premiums will not increase next year, and employees’ benefits, including deductibles, co-payments and maximum out-of-pocket costs, will not change. Will new procedures or therapies be covered in the future? If a procedure or therapy is covered now, it will continue to be covered. In terms of new items that might be covered going forward, we don’t expect any major changes. We will know for certain before NUFlex enrollment begins in October 2018. Any enhancements to our plan would first be vetted by the same university-wide committee that recommended the new insurance providers.